Moving from elementary to middle school can be a huge transition for kids. Even if tweens aren’t talking about their worries, they are probably nervous. And who wouldn’t be? These kids are about to leave the warm and nurturing environment of elementary school and enter a much larger, sometimes chaotic setting. Add hormones and social fears to the mix, and you have anxiety producing scenario — for both parent and child! Here are a few tips to help smooth the transition. Get your tween excited about school with a shopping trip to pick out accessories for his or her locker. Decorate with movie posters or pictures of a favorite band. Adding a mirror or photos of friends can give the new student a familiar home base. Few elementary schools have lockers, so this may be your tween’s first experience with using a combination lock. Plus, they will need to get the locker opened quickly between classes. You can help by purchasing a lock before school starts so that your student can get used to using one. It is hard to go from sitting in the same room all day to moving between different classrooms and even buildings. Many students fear getting lost or being late to class. “For the first week or so, teachers are lenient about tardiness because they understand,” said Brown. Visit the school with your tween ahead of the first day and walk the route your student will take. Most schools offer an orientation for this purpose. Use this time together to answer any questions and point out other important sites such as the bathroom, office and cafeteria. Nobody enjoys changing clothes in front of their peers! Changing in the gym locker room can be a significant source of anxiety for tweens. 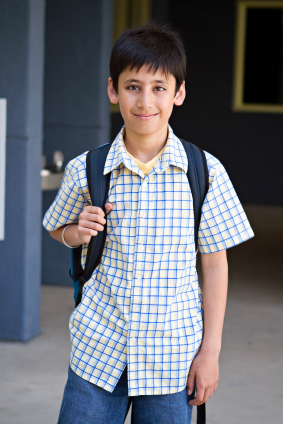 Wearing an undershirt can be helpful, because it can be worn under both the school clothes and the gym uniform. The undershirt stays on while changing, making kids feel less exposed. Middle school is often the first time kids are asked to juggle multiple classes and assignments from different teachers. The homework load also increases in the upper grade levels. To be successful, your student will need to learn both organizational and time-management skills. Teach your tween how to use a planner and a calendar and buy them one they love. An accordion file with tabs can be helpful as well. Make a tab for each class, plus a section for “homework” and “turn in.” The student can quickly slip the papers into the correct slot at the end of each period. A dry-erase calendar at home can be filled out weekly, so that the student can check it every morning to see which classes are on the agenda for the day. Get your student in the habit of packing his or her backpack the night before. Laying out clothes and other items needed for the following day can make the mornings smoother as well. Middle schools often have an earlier start time than elementary, and running around searching for a misplaced homework assignment is a terrible way to start the morning. One advantage of middle school is that there are more clubs, sports and other extracurricular activities available. Encourage your tween to sign up for at least one new activity. Not only is middle school a great time for tweens to figure out what they like — or don’t — but it affords opportunities to meet people and make new friends. Create a care package to store in your tween’s backpack. Include items such as a comb or hairbrush, breath mints, hand sanitizer, an index card with emergency phone numbers, a couple of Band Aids, an extra pencil and pen, and a travel-sized deodorant. For girls, tuck in a tampon or sanitary napkin. Encourage an open discussion about middle school. Remind your student that everyone is nervous. Ask your child if he or she has specific worries or concerns. Talk about bullying and how to handle this issue if it occurs. Also, go over what to do in case of a specific problem, like losing a schedule, or getting lost. Remember that your tween is growing in independence and may not be forthcoming with information. Just continue asking (without nagging) and keep the doors of communication open. “Tell your student to identify one adult staff member at the school who they can talk to. This person may not be able to answer the student’s question, but they can point the kid in the right direction,” says Melanie Strey, Director of Student Services for Kent School District in Kent, Wash.
Middle school is a good time to establish guidelines about social media. “Have a conversation about social media,” recommends Strey. “Even if kids don’t have a Facebook or Twitter account, they may use it at a friend’s house.” Bring up cyber-bullying, and appropriate posting of pictures and messages. Middle school can be a great time to build the skills tweens will need to carry them on to high school. With some preparation and conversation, middle school can be a fun and rewarding experience, for both parent and tween. Learn more about making a smooth transition to middle school.